ANN ARBOR, Mich., Aug. 29, 2017 /PRNewswire/ -- Domino's Pizza (NYSE: DPZ), the recognized world leader in pizza delivery, and Ford Motor Co. are launching an industry-first collaboration to understand the role that self-driving vehicles can play in pizza delivery. As part of the testing, researchers from both companies will investigate customer reactions to interacting with a self-driving vehicle as a part of their delivery experience. This research is important as both companies begin to examine and understand customers' perspectives around the future of food delivery with self-driving vehicles. As Ford builds out its business enabled by self-driving vehicles, conducting research with companies, like Domino's, will be crucial to ensuring that the technology is applied in ways that enhance the customer experience. With a plan to begin production of self-driving vehicles in 2021, Ford is taking steps to design a business to meet the needs of both partner companies and their customers. "As we increase our understanding of the business opportunity for self-driving vehicles to support the movement of people and goods, we're pleased to have Domino's join us in this important part of the development process," said Sherif Marakby, Ford vice president, Autonomous and Electric Vehicles. "As a company focused on the customer experience, Domino's shares our vision for a future enabled by smart vehicles in a smart environment that enhance people's lives." 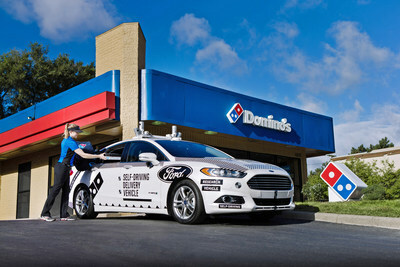 Over the next several weeks, randomly-selected Domino's customers in Ann Arbor will have the opportunity to receive their delivery order from a Ford Fusion Hybrid Autonomous Research Vehicle, which will be manually-driven by a Ford safety engineer and staffed with researchers. Customers who agree to participate will be able to track the delivery vehicle through GPS using an upgraded version of Domino's Tracker®. They will also receive text messages as the self-driving vehicle approaches that will guide them on how to retrieve their pizza using a unique code to unlock the Domino's Heatwave Compartment™ inside the vehicle. "We're interested to learn what people think about this type of delivery," said Russell Weiner, president of Domino's USA. "The majority of our questions are about the last 50 feet of the delivery experience. For instance, how will customers react to coming outside to get their food? We need to make sure the interface is clear and simple. We need to understand if a customer's experience is different if the car is parked in the driveway versus next to the curb. All of our testing research is focused on our goal to someday make deliveries with self-driving vehicles as seamless and customer-friendly as possible." Local partner Roush Enterprises fabricated the prototype vehicle's pizza container, the Domino's Heatwave Compartment, based on its experience working with Domino's on the DXP® delivery vehicle in 2015. Ford and Domino's completed preliminary testing of the delivery process using the vehicle in self-driving mode at Mcity, the simulated urban environment on the University of Michigan's campus. The city of Ann Arbor also has been supportive of the testing process. "I'm delighted that Ann Arbor continues to be at the forefront of autonomous-vehicle research," said Ann Arbor Mayor Christopher Taylor. "While it's pizza delivery today, my hope is that collaborations such as this will enable even more innovations tomorrow." For additional images and b-roll of the vehicle, please go to either media.dominos.com or media.ford.com. Founded in 1960, Domino's Pizza is the recognized world leader in pizza delivery, with a significant business in carryout pizza. It ranks among the world's top public restaurant brands with a global enterprise of more than 14,200 stores in over 85 international markets. Domino's had global retail sales of nearly $10.9 billion in 2016, with more than $5.3 billion in the U.S. and more than $5.5 billion internationally. In the second quarter of 2017, Domino's had global retail sales of more than $2.7 billion, with over $1.3 billion in the U.S. and nearly $1.4 billion internationally. Its system is comprised of independent franchise owners who accounted for over 97% of Domino's stores as of the second quarter of 2017. Emphasis on technology innovation helped Domino's reach an estimated $5.6 billion in global digital sales in 2016, and has produced several innovative ordering platforms, including Google Home, Facebook Messenger, Apple Watch, Amazon Echo, Twitter and text message using a pizza emoji. In late 2015, Domino's announced the design and launch of the DXP®, a purpose-built pizza delivery vehicle, as well as Piece of the Pie Rewards™, its first digital customer loyalty program. Please visit our Investor Relations website at biz.dominos.com to view a schedule of upcoming earnings releases, significant announcements and conference webcasts.